The rear derailleur is one of the more important components on the bike since whether the chain is resting on the correct sprocket or whether it is annoyingly clattering in between is dependent to a large extent on the function of the rear derailleur. A good rear derailleur alone seldom gets the rider any further if the shift cables do not move smoothly: Adjusting the rear derailleur isn't sorcery, and with a little sure instinct and practice, you can do it yourself. At least the cable tension (at the gear lever) should mean something for every bike rider. Since you can correct problems occurring with switching while on the road with a slight turn of the screw. Adjusting or not won't help much if the rear derailleur does not fit the gear lever or the drivetrain itself. What do I have to pay attention to in order to get the best performance out of my bike with the fitting rear derailleur? Rear derailleurs from Shimano, Sram, Camgagnolo: Choose compatibly with the group set! For example you would like to change the rear derailleur or you have to change it? What do you have to pay attention to? Primarily: There are exceptions that work, but basically, the rear derailleur should fit the drivetrain that is installed on your bike. At the end, it is the gear lever which determines the engagement of the gears, meaning the position of the gears, but the rear derailleur also has a gear ratio in its angles and lever lengths. Only with the fitting ratio of per "click" given/pulled shift cable travel of the gear level and the gear ratio of the rear derailleur will the rear derailleur in the end stop in each gear exactly where it is supposed to stop. It is very important that you pay attention to this compatibility. 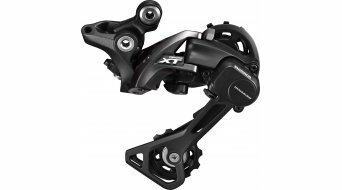 Let's explain by way of an example: It does not necessarily have to be an XT 10 speed Shimano rear derailleur that drives a Shimano XT 10 speed gear lever - an SLX 10 speed or XTR 10 speed works as well, but neither a Sram 10 speed nor a Shimano Ultegra 10 speed will work. In short, the rear derailleur should fit the series but it does not have to be assembled exactly as part of the group. Whatever applies to rear derailleurs applies even more to electronic switchgears, since here, the control also must fit the connection. Also in this case, only ever use the fitting accessories! What does capacity mean in regard to a rear derailleur? The capacity identifies the difference in the number of teeth a drivetrain has, which a rear derailleur can balance with the position of the cage. The more difference between the largest and smallest sprocket of a cassette, the longer the cage of the rear derailleur must be. If there is also shifting at the crank, those differences must also be taken into consideration. What does the rear derailleur have to do with that? It is logical that a very variable drive also needs a long chain and the rear derailleur must be able to guide the chain in every gear and tension. For that, the length of the rear derailleur's cage is crucial. Rear derailleurs for mountain bikes are divided into three cage lengths (short, medium, long) as a rule, at road bike rear derailleurs there are (after the virtual disappearance of the 3 speed cranks) only two cage lengths left. While you best rely on the manufacturer's indications in regard to the selection of the fitting cage for mountain bikes, it is not that easy for road bikes: As soon as I use a sprocket package with a larger sprocket than a 28-teeth one, I need the middle cage. For everything else, the short cage is sufficient. Pulleys must of course fit the rear derailleur. They should rotate easily, guide the chain precisely and, most of all should remain in the rear derailleur. Ideally, the original parts should be used. If other pulleys are to be used for price or appearance reasons, the same applies here: Check the compatibility: We offer a colourful selection, e.g. Hope, Carbocage and Shaman.